This post contains affiliate links. That means if you click on a link to purchase an item, I will receive a small kick back at no extra cost to you. There are lots of components to infant play, but don’t let that scare you. 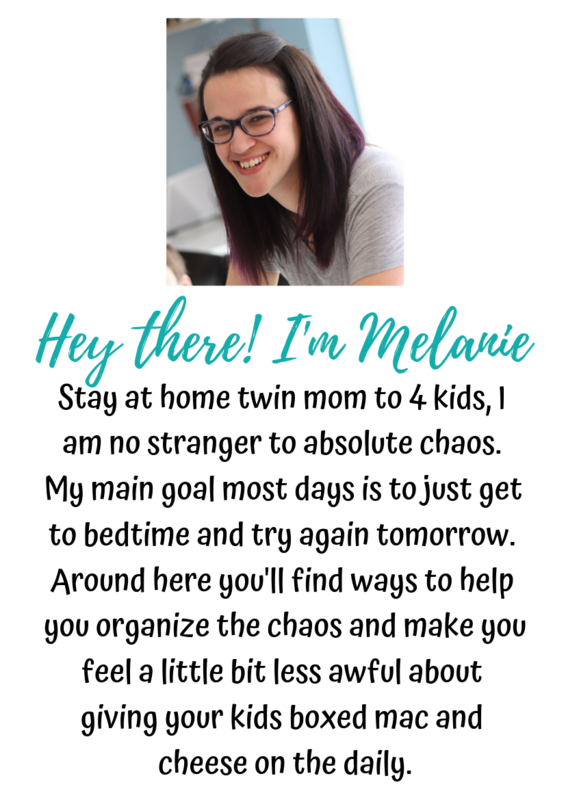 It really, truly is easy (and if you’re a regular around here, you know that I aim to make things easy for you!). This post is going to break it down for you and make it doable. Something to remember – these are NOT activities that you can leave your infant alone. You should always, always supervise their play and stay within arms reach! If you’ll notice, I don’t break down the bullet points to ages. I personally feel people get too caught up in ages and what their infants “should be” doing. I get this question all. the. time – and each time, I squirm. “Why do I need to play with my infant?” “What does it do for them?” “They can’t possibly be getting anything out of it.” Do you know what they’re getting out of it? ALL THE THINGS. Hearing: Talk to your baby. Play music for your baby. Baby talk is ok! I know it can be annoying to some people but babies actually enjoy the higher pitch sounds. So for the first 6 months, it’s encouraged. Read them simple infant books. Sensory: Oh boy, that “sensory” word which is probably found in every single one of my posts. Touch your babies! Feet to feet, hand to hand. Research has shown that touching your babies actually helps with development. Isn’t that crazy? This is why skin to skin is so important when a baby is born. Sight: In the first few months, keep the colors to a minimum. Simple picture books for them to look at and people’s faces are very important. Use this “face time” to also chat with your baby. As they get older, they will start to “talk back,” (but not in that threenager way – this one is more pleasant) and this helps improve speech development. Relationships: By playing with your baby, you’re teaching them about your relationship. You’re here for them and you want to be around them. Comfort: Keep it comfortable! Depending on where your baby is in development, use their most comfy position. If you’re working on tummy time and your infant doesn’t enjoy tummy time, this is a perfect way to work on it. The best advice I give to parents who say their infant doesn’t like tummy time is to distract them. Give them some stuff to play with so they don’t even realize they are on their tummies! You may also want to grab some foam tiles for the floor. These were awesome for my youngest before she was mobile because we had all hardwood floors. On their stomach propped up on a Boppy pillow. This is about the only position that will work for a non-mobile, non-sitting infant. Lying on their back can work, but you run the risk of the toy dropping on their face which is no fun. Once they begin to have some head control, they can be on a soft blanket. An infant that is learning to sit and seems to have ok head and trunk control can sit in a Sit me Up, Bumbo seat, or something of the like. 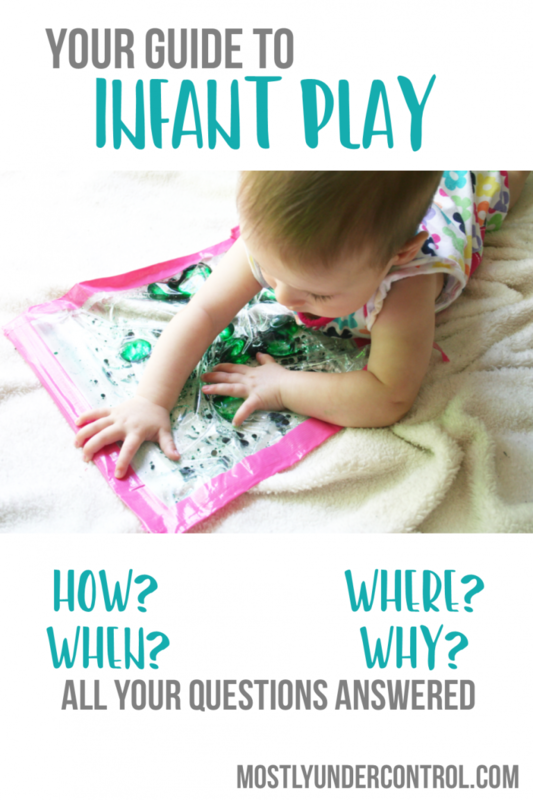 Baby water sensory bag: This is an easy activity with supplies you can grab from the dollar store. Sensory bottles: Another easy activity with supplies you can grab from the dollar store. Even the hot glue gun! Ice cube painting: Water, food coloring and popsicle sticks. Done! Baby sensory board: This one requires collecting wipe tops, but how quickly do you go through wipes with a baby? Very quickly. Sensory play with hair gel: Some hair gel in zipped and taped bags that we attached to the back door. These stayed on for a long time! Floor Mirror: This is great for tummy time. Infants love looking at faces and discovering their own. Infant activity gyms: My kids loved these! Check them out on Amazon. As always, please feel free to comment below with questions! You can also tag me on Instgram (@mostlyundercontrol) and let me know you’re doing these activities with your babies. What did you learn?